She hasn’t once lunged or growled at strangers since we met with Anthony. It has been a few months since we had a 2 hour session with Anthony for our puppy Dalí Madison, and it has made a huge difference in our lives. Before we met with Anthony, Dalí was very hyper and would bark and lunge at men she didn’t know when I walked her. Anthony encouraged us to get her out more and trust her off leash in the mornings (before we saw her with him we wouldn’t have dreamed of letting her loose). He taught us some simple behavior cues and a better method for walking her so she would stop pulling. Now Dalí is much calmer and happier. She hasn’t once lunged or growled at strangers since we met with Anthony. She is able to play off leash every morning and always comes back when it’s time to go. 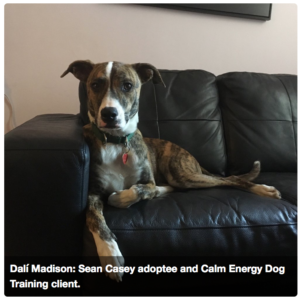 People often comment how good she is, and it is really thanks to Anthony and Calm Energy Dog Training.